LabSC has the capacity and expertise to perform both standard laboratory furniture and specialized furniture as robot cabinets, fire cabinets and fume cupboards servicing. 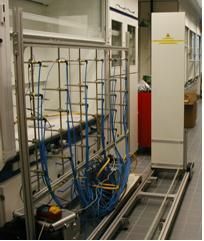 The maintenance (or support thereto) includes the technical equipment of laboratories including the piping. LabSC does not limit itself only to control but optionally provides complete and implement improvement plans. LabSC know what this requires expertise and the people who should be enabled. Obviously LabSC VCA standardized. But even more important is that we work in accordance with the ISO standards.